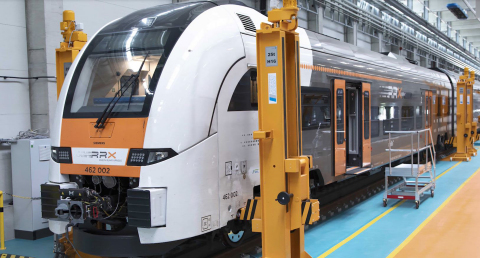 MINNEAPOLIS & REHOVOT, Israel--(BUSINESS WIRE)--Sep. 19, 2018-- Siemens Mobility GmbH, part of Siemens AG, has opened its first digital rail maintenance center – the Siemens Mobility RRX Rail Service Center. Located in Dortmund-Eving, Germany, the new maintenance depot offers the highest level of digitalization in the rail industry, with advanced FDM 3D printing from Stratasys (Nasdaq: SSYS) at the heart of the depot’s servicing operation. Stratasys is a registered trademark and the Stratasys signet is a trademark of Stratasys Ltd. and/or its subsidiaries or affiliates. All other trademarks are the property of their respective owners. ULTEM™ is a registered trademark of SABIC or its affiliates.